#1: Don’t treat the beams as display space for dried flowers and roosters–or anything else, for that matter. #2. 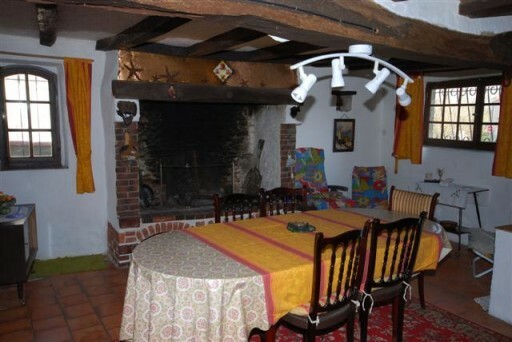 Forget the track lighting–especially when you live in a 200-year old French cottage like this one. #4. Please. Whatever you do. Don’t paint them pink. .-= Laura´s last blog ..A cup of tea and a recipe for a Mocha Muffin =-. Europeans really, really, really like track lighting. I have no idea why. It’s everywhere over here! This is rather funny! I’ve never seen any beams and so many all crossed up!! Now we have beams in our den that were dark like the paneling but we finally painted them white! Big improvement – I pretend they are not there and it makes our low ceiling look a tad higher. .-= Shelia´s last blog ..I Hate To Admit It- But =-. .-= Becky @ Farmgirl Paints´s last blog ..Coloring outside the lines =-. At least the pink can be fixed, but that kitchen ceiling is a MESS!! That first one scared me to death! It looks like the beams are in the process of imploding or something, to come crashing down into the room. How ODD. .-= Katherine @ Grass Stains´s last blog ..She did it again =-. I was thinking, “where are the swings”! Love this post….we do My Design Guide.com -” My D – don’ts” – some times I’m afraid of offending someone….your post is fun and funny. #1 … I’d be afraid one of the roosters would swoop down and peck me to death! Love your blog! This is hilarious. .-= Leigh´s last blog ..And She Wore White =-. My family room has high ceilings and beams. 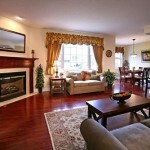 They were stained a dark color, and I thought it was ok because of the size of the rooms and the height of the ceiling. Then…we painted them white. WOW, what a difference it made, the beams make an ever greater impact in white. We did the same thing at our cottage..painted them white and it looks great up there too. Those kitchen beams…they just need to go! LOL! .-= Pat´s last blog ..Messy Manicotti =-. * To see such GREAT POTENTIAL just TOTALLY destroyed is HEARTBREAKING, Julia!!! I’d say “SHAME on those HOMEOWNERS!”, except sadly enough, it appears they just don’t KNOW any better… heartbreaking just the same, tho!!! HOW MANY of your READERS would L*O*V*E to get their hands on THIS?!?!?! This reminded me of the house we lived in during the early 70’s. My parents had the brilliant idea of installing “faux beams” in our kitchen, I guess to give our modern, 60’s-built house a warmer, country feel. However, the beams, which were actually made of some sort of styrofoam-type material that was painted and textured to look like wood, were only glued to to the ceiling and would often fall down on top of us while we were sitting at the kitchen table. Wonderful childhood memories..! That is so funny, Lisa! Ah, the ’70s! .-= Kelly@40isthenew30´s last blog ..Worth Mentioning- Online Artisans =-. All I kept thinking while reading this was “Oh dear”! We have neighbors who are continually “creating” this type of “design” both inside and *out*, and we’re forever stuck smiling, nodding, and feeling a bit “unwell”. Are we snobby?? Or is it okay to say that a house isn’t supposed to look like a big blueberry! .-= Jessica´s last blog ..Bravery &amp Flowers =-. Oh man! These are baaaaad! They are all nice spaces, but so unappealing in their decor. Bleh! .-= Jocelyn Stott´s last blog ..Country Eye Candy =-. Someone I’m close to (whose anonymity I feel obliged to preserve) has their beams painted grey. It does kind of suit their overall decor, though, if that says anything. It’s weird to see what someone else does to your house after you move out. Even if it’s better. I once glimpsed into a house I lived in for many years growing up and was sorry to see all the 1970s era carpeting, linoleum and wallpaper replaced, even though it was definitely for the best! P.S. Just thought I should stress that I do NOT think beer stein collections on ceiling beams is an improvement… in case it sounded like I might! To quote Jed Clampett, “Pitiful. Juuuust Pitiful!” Although, now that I think about it, he just might have thought all this decor was beeeeyouteful. Each picture is a different school of awful…I love it in a cringeing sort of way – maybe I just feel better by comparison? .-= Tricia Rose´s last blog ..The Sistine Floor =-. Oh my. I really didn’t think one could mess up beams but apparently bad taste knows no boundaries. I think it is a tie between the track lighting and the pink paint for worst abuse of a beautiful beam. .-= hip hip gin gin´s last blog ..Melinda Maria =-. Picture #1 reminds me of a Cracker Barrel Restaurant! The first picture looks like a giant radioactive spider on the ceiling waiting to strike those foolish enough to sit below. .-= Josanne´s last blog ..Dan Shares A Blon Moment =-. LOL on them all! What are people thinking? The couches in the first pic are similar to ones I had in the early 70s. That’s just so sad. 🙁 The use of the beams as display is the worst….plus, what a dust catcher!!! LOL… such a fun post. Is that a fake rooster perched in the first photo? Too funny. .-= cristin @ simplified bee´s last blog ..Halloween Decorating Ideas for Your Home – Many DIY &amp Inexpensive =-. I know someone who decorates their beams. Ya, I think it’s a bad idea! .-= the domestic fringe´s last blog ..Parenting 2010 Style =-. Oy. You called it, Julia. It appears to be an epidemic. .-= Courtney @ nesting instincts´s last blog ..virtual nesting at NestInk =-. Wow #1 is incredibly scary. I imagine it would feel like a spook alley, How often do those little critters get dusted? The track lighting is hilarious! Sometimes you have to wonder what people are thinking! .-= Our Nifty Notebook´s last blog ..Homeschool- Week 8 Review =-. LOL These were so good I shared them with my mister. .-= Juju at Tales of Whimsy.com´s last blog ..Teaser Tuesday- Choices =-. What funny pictures! 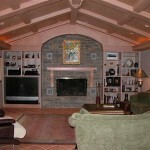 I’m guessing the home with the pink beams were made in the 80’sor 90’s, when pink was in style. At least they can be fixed. Tacky track lighting on a beamed ceiling. Well now I’ve seen everything. Question, where am I supposed to put my rooster? .-= Bre´s last blog ..Independent Fashion Bloggers Conference =-. Oh, but the pink mantle is sooooo pretty! It would look great with my collection of Disney princess figurines on top! LOL! This was a really fun post, Julia! Who would think that beams could be messed up like that?! The kitchen one was the funniest one for me – who would have thought one could CRAM beams on a ceiling like that?! So funny. .-= Gloria´s last blog ..Day 2 – For Thelma and Louise =-. These examples are a tragedy with poor execution. 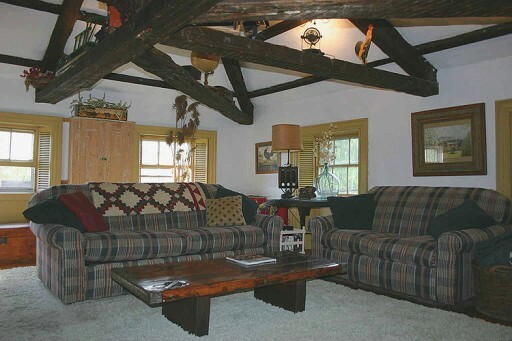 Trusses and beams can be a great accent to a space when the scale of the room and size of the beams are proper. Good achitecture is a matter of fractions of an inch to get it right. Unfortunatley its a little late for thes homes. Wow! I thought that our beams were bad (we fixed them, don’t worry)! When we moved in our entire condo was painted white. Beams…white. Rough sawn cedar fireplace…white. Walls…off white. Gah! At least they weren’t pink, though! Still, it took my husband a good 8 months to strip off all the paint and restain everything. Who would paint beams white and have a white ceiling? Lame. That is hilarious. Love the chickens.